Building a new home from scratch is a daunting task, one of the key parts of which is working effectively with your home builder. As mentioned earlier we moved into a newly built home over a year ago and got to know first hands the trials and tribulations of working with a builder. I’ll try to document the process in a series of blog posts called “New Home Basics”. Today we’ll explore more on what to expect when you build a new home with a builder. To give some more background, we shopped around at quite a few builders, all the way from national brands to local builders, trying to find the floor plan and option lists that worked best for us. Irrespective of the size, this is how we felt about the builder’s stance in dealing with prospective home buyers. Everything else is an upgrade option. Hear the $$$$? During different promotion times, the builders just tweak the list and presented the whole thing as a whole new scenario. They minus something from the freebie list and in turn add something from the upgrade option into the base price. There is usually a big discount to buy at the pre-model stage, i.e. when they haven’t even built the model house. Why? Because of the risks involved, you will have to make your decision based off of the floor plans like we did. There are cons to this method too (coming later). The builders always have their interests up front (as if you didn’t know that already). List of freebies vary from builder to builder. For e.g. stainless steel appliances were a freebie for our builder during that time but not for others. As part of promotions, they do give you some credit to spend at the design center to choose options. The $ amount varies with builder. They also have teacher and armed forces discount. So what should be your stance? Building a bond with your sales rep helps a lot. If so they will go out of their way to help you. In our case, B wanted a range hood and they said that they couldn’t do it. We kept insisting nicely and after some back and forth they did it for us, for the first time. Sometimes, they can give you valuable inputs on the options. As they sell so many of these houses they know what people are looking for in a house better than you do. Case in point our built-in trash can, attic fan, and higher bathroom sink counters. I thank our sales rep every time I use these. Stick to your design center budget no matter what. You can get carried away so easily. Plus the options available are endless and look so good at the center. You would want to upgrade everything. Pay close attention to the appliances listed in your options. In our case the base price included stainless GE Profile appliances. We were fine with the ovens, fridge, and the microwave. But the dishwasher was a totally different story. We didn’t have a good experience with the GE Profile dishwasher that we had in our rental. So we had to upgrade to a mid-level GE Profile. Yes it was an upgrade even though it was GE profile. When you choose your floor plan pay close attention to the direction the light is coming from into the house. We wanted all the bedrooms upstairs, so we added the 5th bedroom in what would have been the retreat, going against the sales reps suggestion to leave the retreat alone and add the bedroom in the basement. This turned out to be the biggest flaw of building the house without seeing the model. Luckily for us the model house was completed when our house was in the initial stages of the planning. We realized that by converting the retreat upstairs to a bedroom we would completely block out all the light upstairs and make the hallway appear so narrow. The $500 it cost us to process the change order to change it back to the retreat was well worth it. Once you start building you could do a pre-dry wall inspection; we didn’t. But we did take pics of everything pre-drywall, in case some contractors need it in the future for reference (we wouldn’t have a clue of where things are). Our builder used to send us weekly pics with updates. If yours don’t you can always ask. Keep your eyes open for anything that is not done according to plan. We spotted a missed outlet in the retreat (resulting from the bedroom/retreat confusion mentioned earlier), which they took care off right away. All said and done, are we happy with our house? Absolutely yes! Are there things that we would like to change, things that we wish we had asked during construction? Of course yes. That is stuff for another post. You can learn more about our initial days in the house here. Did you run into any issues while buying your home? Any future home buyers out there have you figured out your ‘absolute wants’ vs. ‘would like’ lists yet? 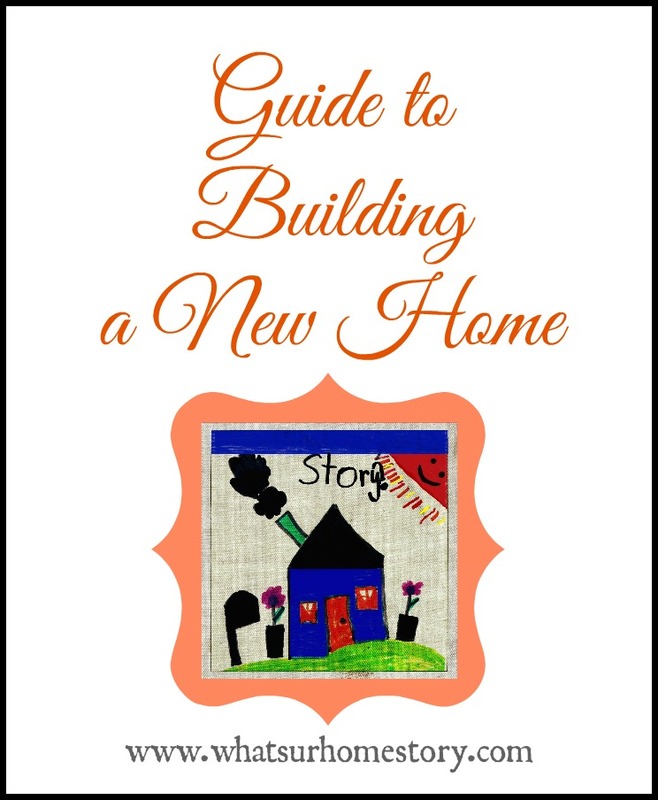 What is on the top of your guide to building a new home list? Good info for the new home buyers.Thanks for posting it. Thanks Prajusha. Hopefully someone can use it. Hey Vidya, thanks for stopping by…liking your blog. Great tips above…I live in a cookie cutter too…so its important to think through it all and be happy with what you end up with. Sundeep, Thanks for dropping by. Love what you did to your fireplace.